This is a great read-aloud book that you can present to your students. It may also be one that is assigned for individuals or groups. Whatever the case, these lesson plans for A Week in the Woods will include a “News Conference" at the end of the novel with students assuming the roles of reporters and main characters. Also included is a printable assessment page that you can use, a partner project reviewing literary devices in the book and a writing assignment. Alliteration – repetition of the beginning consonant at least twice in a row. For example: “Peter Piper picked…"
Onomatopoeia– using words to imitate sounds they describe. For example: hiss, crackle, screech. Personification – giving human qualities to objects or animals. For example: The wind called her name. Simile – comparing two things using the words like, as or as though. For example: His socks smelled like a wet dog. When the assignment is complete, take time to share everyone’s answers and discuss how the use of figurative language enhances the writing. You may want to follow-up by having the students do some writing of there own using these devices. In this age of twenty-four hour news on television, it is necessary to keep the viewer entertained with the latest drama from all over the world. Imagine that when Mark and Mr. Maxwell return from their adventure in the woods, there is a group of reporters awaiting the arrival. The reporters are clamoring for the details of the missing boy in the woods. Set up this “News Conference" scenario in your classroom. Depending on class size, you may want to divide students into a few groups to hold individual press conferences in front of the class. You may want to choose the characters of Mark and Mr. Maxwell randomly or purposely ahead of time. Arrange a long table or podium for the main characters to sit or stand to respond to the press. Each reporter (student) must write two probing questions ahead of time to ask Mr. Maxwell and Mark. Encourage the students to “dig" for information: why Mark ran away, why Mr. Maxwell jumped to conclusions about Mark, how they felt when each was alone in the woods, how they feel now, etc. Mr. Maxwell had preconceived ideas about Mark and not all of his presumptions were true. Then, when the knife turned up in the bunkhouse, Mr. Maxwell thought the worst about the situation and did not ask questions to find out the truth. Has there ever been a time when someone has jumped to conclusions about you? Or perhaps there was a time when you jumped to conclusions about someone else and later found that you were wrong. Write about it. Include what you learned from it. Use this printable worksheet (click here) to assess your students’ understanding of the characters in the book A Week in the Woods. 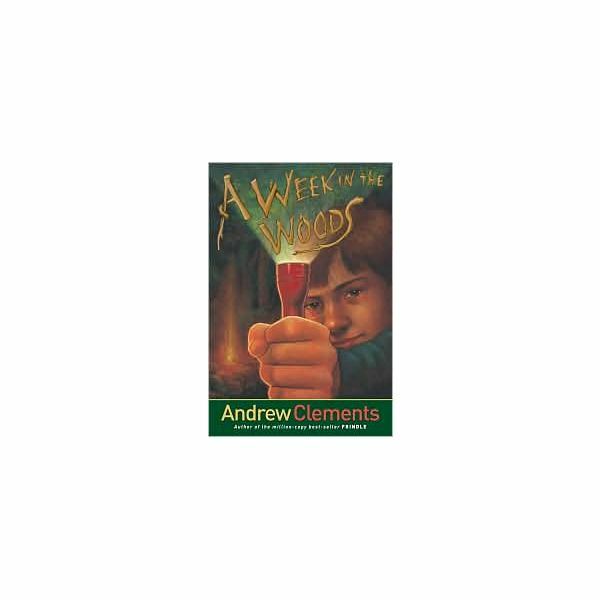 Hopefully these ideas for A Week in the Woods lesson plans will have enhanced student understanding of this book by Andrew Clements. It may encourage readers to choose another of the Andrew Clements' novels for independent reading.